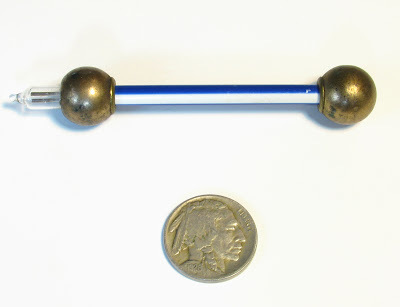 SECRET FUN BLOG: THE ELECTROSTATIC GENERATOR! 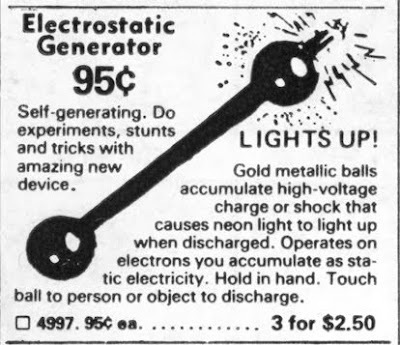 The Electrostatic Generator is an item that was sold in comic books for decades, yet in all of my years of scouring eBay I've never seen one pop up. In fact I've never been able to find even a single image of one anywhere on the world wide web. Thus it was one of my wish list items for Mail-Order Mysteries that remained a mystery. It's smaller than I originally imagined, of course, but it did indeed light up. David says, "You'd hold it by the bottom brass ball, rub your feet on the carpet, and the touch the ball on the end with the little light bulb. The bulb would issue a faint orange flicker, for fractions of a second." So it's not exactly good for a spare flashlight, but it sounds like enough to keep a kid intrigued for a while. Glad you finally got one! It's identical to the one I had that I had told you about. I never got mine to work at all, so you've got me beat.